In 1958 one of Britain`s greatest locomotive designers died without public fanfare or recognition, mourned only by his family. 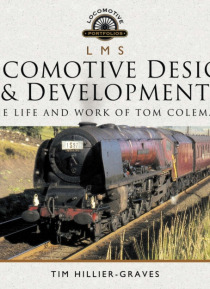 Yet William Stanier, arguably one of our greatest engineers and his leader, said of him that without his Chief Draughtsman all he achieved with the LMS would not have been possible. How could such a man slip from our view and remain anonymous, although his Princess Coronat… ions, Black 5s and 8Fs are regarded as three of the finest classes of locomotive ever built? And today many survive as stars to grace the ever growing preservation movement.In reality, Tom Coleman was an intensely private and modest man who never sought recognition or commendation. His need for privacy may be one reason why his life has remained shrouded in mystery for so long, but finally his story has been slowly pieced together from a wide variety of sources, many previously untapped. So now we can see for ourselves his great contribution to railway history and recognise his singular talents.